*Affiliate links. Full disclaimer details here. One of my blog goals for 2017 is to diversify my content a bit – which mainly means trying new brands, featuring more drugstore makeup and giving some super fancy brands more exposure/information to my readers. Today, though we’re doing the affordable stuff. I picked up a few product at my local Wal-Mart that I’ve heard great things about, as well as, made a ColourPop order that was well past due. 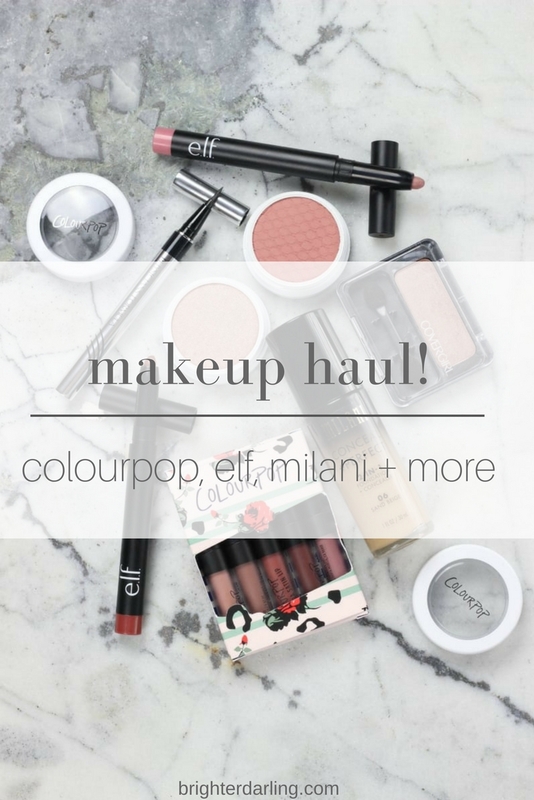 Over the last week or so, I’ve played around with these items and I wanted to share with you what I picked up in this affordable makeup haul and why it may be for you. When I wrote my 2016 Beauty Favorites, it reminded me how much I love ColourPop and haven’t played with my ColourPop stuff in a minute. The texture is unlike anything else I’ve tried (sort of a cream, mousse, powder hybrid) and the price point is unreal (everything’s under $10… most products are under $8, actually). 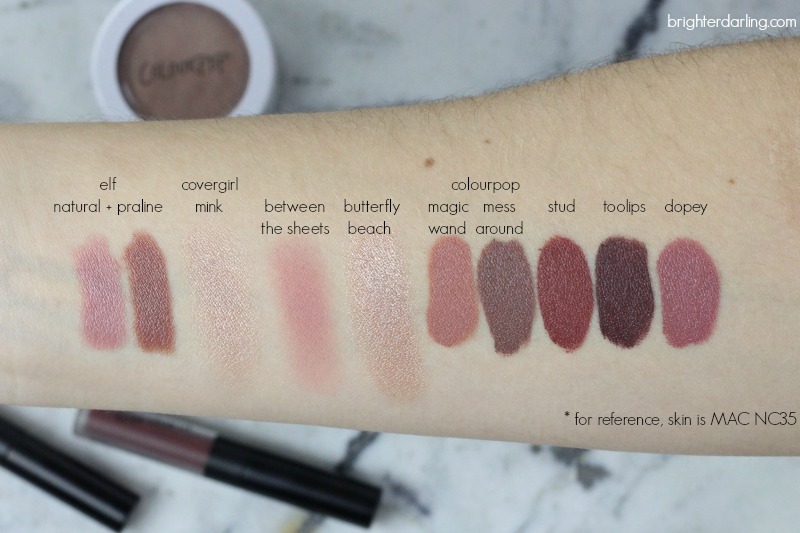 You still may be wary of ColourPop because you can’t see the products in stores. Well, please rest assured the swatches they do on their site are very accurate. 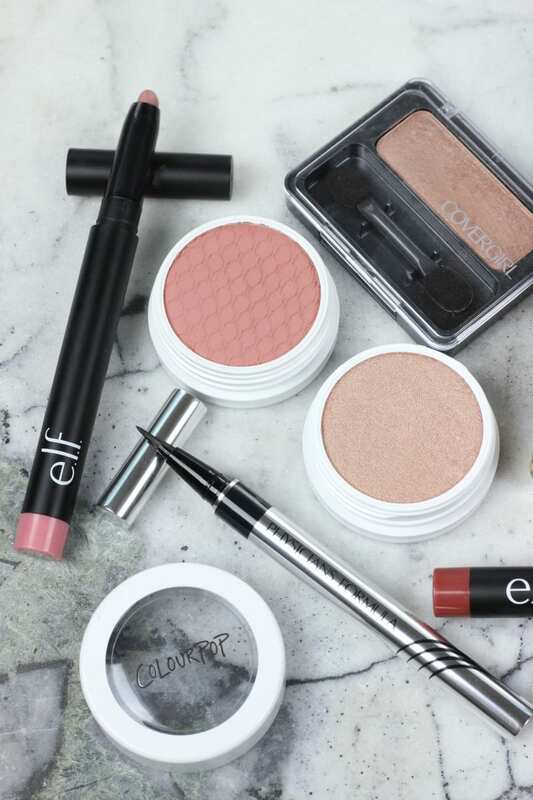 I picked up more of my loves – the Ultra Satin Lips ($6/ea) – in this convenient neutral set. The “On A Whim” set ($18) includes five permanent shades in a mini size: Magic Wand, Mess Around, Stud, Too Lips and Dopey. I mainly wanted Dopey but the others are equally wearable and the formula is perfection. Besides the lip products and eyeshadow, I haven’t tried anything else from ColourPop so I felt it was time to expand. I picked up a highlighter in Butterfly Beach ($8) and a blush in Between The Sheets ($8). Butterfly Beach reminds me of a slightly darker Becca Shimmering Skin Perfecter in Opal ($38) and Between The Sheets reminds me of a creamy/mousse version of MAC Melba blush ($23). Both all time favorites for me, so I’m very happy with these so far. 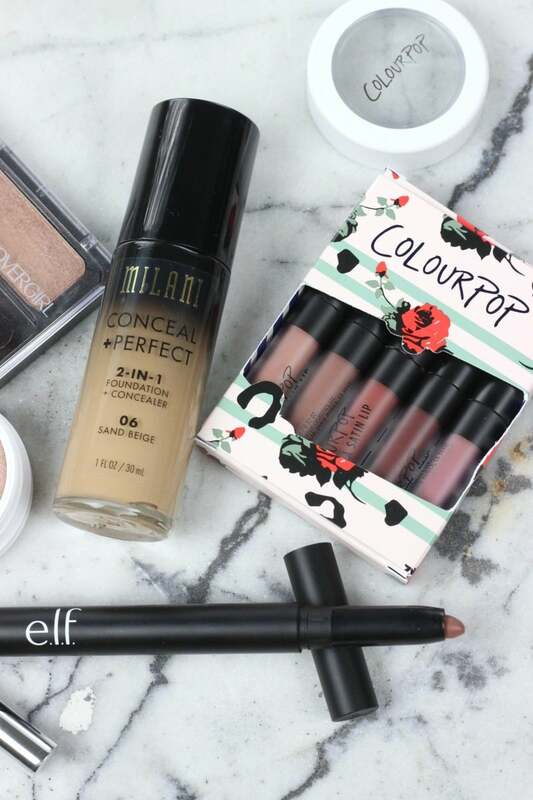 One of my favorite YouTubers, Tati, raved about the Milani Conceal and Perfect foundation ($8.97-$9.99) all year-long. As we know (if you read my blog a lot), I’m terrified of most drugstore foundations because of my temperamental skin. I am really trying to find more affordable stuff for my readers who aren’t beauty junkies like me, so I picked up the foundation for testing purposes and it’s NOT FOR EVERYONE. Personally, I like it a lot. Do I like it more than my more expensive foundations? Not sure yet. It’s a full coverage, thicker formula. It does last all day long and doesn’t seem to break down on my oily skin, but my husband says it looks cakey on me (what does he know?!). I’ll try to use this foundation in a tutorial or makeup look on IG soon and you can see for yourselves. But if you’re looking for a foundation under $10 at the drugstore that will cover all of your sins and last all day long, this one is a solid choice and even has a pump! When I reviewed the elf box from Influenster, I told you all I really liked the matte lip color in Wine but wanted to try a few more shades. I picked up Natural and Praline ($3/ea). The formula is just as good as Wine, but I’m not too thrilled with the color reference on the end of the packaging – neither one of the colors on the end of the lipstick tube really match with the color you get. On me, these shades don’t seem to do much for my skin tone, but again, I’ll try to use them in a look for IG and maybe they’ll photograph better than they seem in real life. You all should know I love my $2.99 essence cosmetics waterproof liquid liner pen. It’s been over a year since I’ve bothered with a high-end liquid liner since I tried it because it’s just as good (if not better) than the Stilas and Kat Von Ds of Ulta and Sephora. 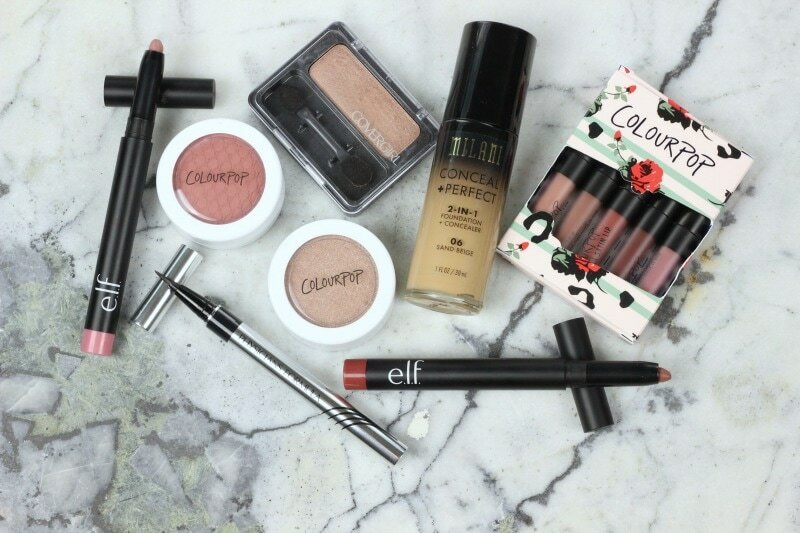 But of course, a beauty junkie needs to find MOARRR. I couldn’t find this Physicians Formula Eye Booster 2-in-1 Lash Boosting Eyeliner + Serum ($8-10) for months – I needed the ULTRA BLACK color – so when I saw it at Wal-Mart, it came home with me immediately. This is an EXACT DUPE of the Kat Von D liner in Trooper. Same brush tip, same blackness and it is advertised to last 24 hours… it probably does, I just don’t wear my makeup that long but it certainly doesn’t smudge or flake whatsoever on me. For less than $10, next time you run out of Kat Von D, order/buy this one. SOO good! Have you tried any of these yet? What are your thoughts? Let me know what other products from the drugstore you’ve been curious about so I can add it to my shopping list! "My Go To Winter Outfit (all on sale!)" "Morphe Copper Dreams Brush Set Review"